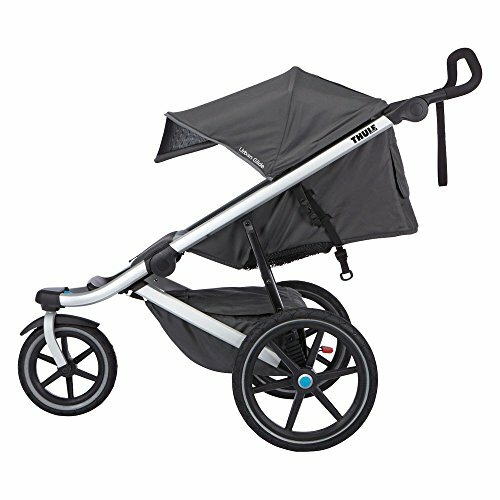 The Thule Urban Glide is an all-around sports stroller with a sleek and lightweight design making it perfect for urban mobility or jogging on your favorite path. The Urban Glide has a adjustable and ergonomic handlebar which allows a large range of user heights and preferences. With a twist of a knob, the front wheel can be either free pivoting or locked forwards or backwards for running and/or use in sand, snow, etc. a tool-less tracking adjustment feature ensures straight strolling. The multi-position sun canopy is easily adjustable to block the sun in any position and has a "view-in" roof port. This stroller has a pinch-free design that can be folded with one-hand. It is easy to keep your child comfortable with the reclining padded seat that has infinite adjustability. There is plenty of storage with the extra large under the seat compartment. Optional accessories include the car seat adapter and snack tray, sold separately.